The ever-popular promenade is now riddled with holes, rotting wood, wobbly boards and exposed nails. In some parts there are wooden planks that jut up several inches, almost inviting someone to trip. The Parks Department says it's making repairs (the strategy this year seems to be nailing planks over the holes in the boards, presenting a brand new way for people to break their faces while enjoying the Brooklyn outdoors). They sent a statement to the Bay News saying "we continue to repair any hazards to ensure a safe pedestrian experience along the boardwalk." The pedestrian experience is so safe, in fact, that seven injury lawsuits were filed in 2005 and 2006 and $157,000 in settlements have been paid in nine cases filed since 1997. The problem is said to be "on the radar" at City Hall and some extra money will be put in place for emergency repairs. 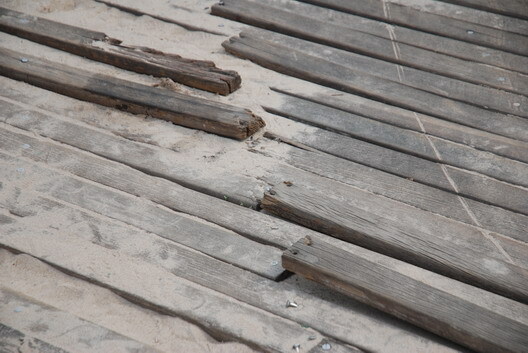 A major repair job, which the boardwalk desperately needs, would cost millions. nytimes had an interesting article on the boardwalk and a cop whos worked out in coney island for 20+ years. the article mentions that people used to walk around and do illicit stuff under the boardwalk, so they built the sand up so that it nearly reached the top of the boardwalk. now, however, the built up sand (along with other wear and tear) is causing the boardwalk to rot. The article is called "Keeping Peace on Salty Planks and Shifting Sand." Its from July 14 if you want to check it out.